In its ongoing quest to incentivize every facet of human existence with largely meaningless numerical scores and shiny badges, Microsoft has added Xbox 360-style Achievements to Visual Studio. For those of you who just enjoy videogames and don't give a toss where they come from, Visual Studio is an industry-standard integrated development environment. In layman's terms, it's the program that game makers use to make the games you know and love. As with all things however, it lacked certain inherent motivational tools to keep users on task (aside from "you'll be fired if you don't keep coding"), thus Microsoft's new line of Achievements. For the most part, they function identically to their Xbox 360 counterparts, only instead of asking users to kill 10,000 enemies, the Visual Studio Achievements task coders with mundane program-specific goals such as writing "a class with public, private, protected and internal members" or coding on the weekend. The full list of Achievements can be found on Microsoft's Channel 9 website, but before you all scamper over there, eager to artificially inflate yet another arbitrary score and thus add some semblance of meaning to your life, I've got more words to throw at you. Alright, so I'm as big a fan of the Xbox Live Achievement system as anyone. I think it offers a nice, running storyline for a player's ongoing experience with the console. I also like that it's been adopted in various forms by other gaming companies. 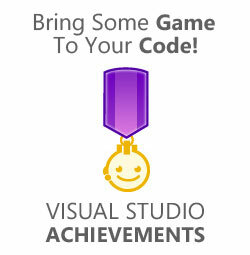 That said, applying Achievements to Visual Studio gives me an eerie feeling. By applying this gamification-lite concept to the program that originally spawned the games that originally spawned the gamification-lite concept, Microsoft has created a giant, geeky Ouroboros, that won't be content until it devours 15,000 feet of its own tail and a happy notification appears heralding the 25 gamerscore points it just earned. We're through the looking glass here people.